The Maoris of New Zealand developed a style of marking the body that was unique in the entire world. They took a piece of bone from a bird's wing, shark's tooth, stone, or hardwood, averaging ¼ inch across. This chisel would be lashed to a beautiful carved piece of wood. Placing the edge of the chisel to the skin and then striking it with a mallet would make a cut in the skin. This would cut deep-scarred furrows in the skin and then pigment would be applied to the furrows. 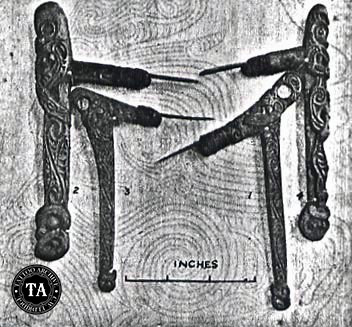 The tools used for this tattooing were called Uhi.